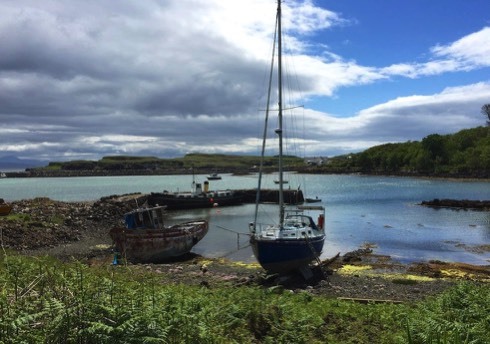 On the next day of the trip we decided to visit the isle of Eigg, so we headed to the port village of Airsaig to catch the Boat MV Sheerwater The journey out to Eigg is about 10 miles and the water can be quite choppy so the boat was up and down a bit but made for good fun. They charge £19 for a return Ticket to the isle and you get about 4 and a half hours on shore, the boat will leave after dropping you off for the isle of Rum and will get you on the return crossing. As you disembark the boat on Eigg you will find a small shop and post office they also have walking information with various distances depending on your time on the isle. The views are dominated by the massive Sgurr a 393m high rock that will take about four hours to climb, we were a bit short of time so we had to leave this for another day it was a shame as the views from the top are fantastic apparently. We decided to follow a walk we downloaded from the net and headed off in the direction of Rubha na Crannaig where there is remains of a small church and some old graves, also the area is full of bird life, we were hoping to view some Whales out in the bay but they alluded us this trip we had to settle for some seals instead. Some bits of the island are a bit boggy so make sure you take good footwear or you will get wet feet, also watch out for cow pats that pretend to be stepping stones. A visit to the island is definitely worth the time and we could have spent a few days on there having a good look about on foot so we shall return one day hopefully. After a short trip to Mallaig we made out way to the Glenfinnan monument and viaduct, it was from here that Charles Stewart (Bonnie Price Charlie) raised the royal standard for his Father and tried to get his family back on the Throne. The monument is huge and there is a National Trust for Scotland car park and information building just over the road, also in the grounds of the monument we were lucky to see a Red Deer. You will find also the Glenfinnin Viaduct a lot of people will remember this from the Harry Potter films, and you can get a good view of it from climbing to a view point that is well marked however it is still a fair way away so we did not get a good look at it.